Why do so many Americans feel that politics has become irrelevant to their daily lives? Why is there so little public discussion of important social issues, despite unprecedented access to mass media and new communication technologies? This book delves beneath the sound bites and news headlines to explore the ongoing process of depoliticization in the United States. Attuned to the many contemporary trends eroding the public sphere, Carl Boggs illuminates the American retreat to an eerily privatized landscape of shopping malls, gated communities, new-age fads, rural militias, isolated computer terminals, and postmodern intellectual discourse. Yet Boggs maintains hope that current trends can be reversed, issuing an eloquent call for revitalizing politics, culture, and civic society. 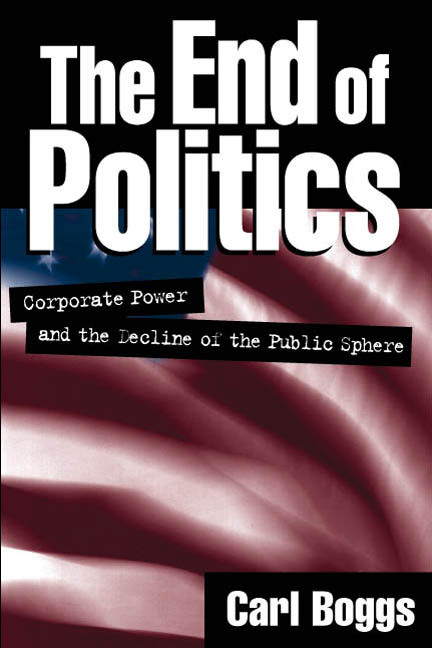 The paperback concludes with a new postscript on the movement against corporate globalization and the tumultuous presidential election of 2000.